Home > Used Vehicles > 2018 Subaru Forester 2.0XT Limted w/ Eyesight,AWD,LEATHER,SUNROOF,NAVIGATION, FULLY LOADED,CLEAN CARPROOF!!!! 2018 Subaru Forester 2.0XT Limted w/ Eyesight,AWD,LEATHER,SUNROOF,NAVIGATION, FULLY LOADED,CLEAN CARPROOF!!!! Low Mileage, Navigation, Adaptive Cruise Control, Sunroof, Bluetooth, Heated Seats! This Subaru Forester is well-prepared to keep up with your life, from planned vacations to spontaneous hiking trips. The wide cargo area can accommodate four large suitcases and even the bulkiest of adventure gear. 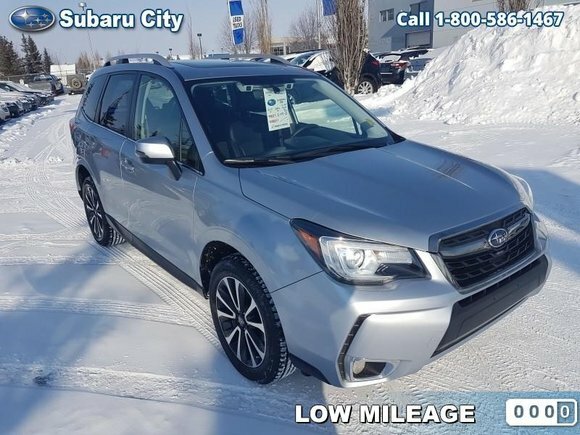 This Subaru Forester boasts an unbeatable combination of all-road and all-weather capability, superior reliability, advanced safety features, exceptional value and sheer driving enjoyment. This low mileage SUV has just 8343 kms. It's ice silver metallic in colour. It has an automatic transmission and is powered by a 2.0L H4 16V GDI DOHC Turbo engine. This vehicle has been upgraded with the following features: Navigation, Adaptive Cruise Control, Sunroof, Bluetooth, Heated Seats, Premium Sound Package, Rear View Camera. It has some remaining factory warranty for added peace of mind.